I was so excited when my brownies won a 2011 Great Taste Award. 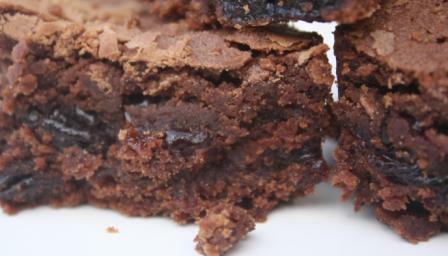 This recipe uses dark organic chocolate with dried cherries giving a rich flavour and moist texture. If you are going to indulge yourself with a treat, make it worthwhile. Makes around twelve brownies (depending on the size you like them). 185g dark chocolate, broken into rough chunks. The better the chocolate the better the taste, I use over 70% cocoa. 110g gluten free plain flour, sieved. Use a blended flour such as Dove. 200g dried cherries, cut each one in half. This spreads them out better in the brownie mixture. However it is quite a bit of work so you can avoid this part and just use them straight from the packet. Sainsbury’s own brand cherries are good for this recipe. 1. Preheat oven to 350⁰F, 180⁰C (160⁰C fan oven). 2. Line or butter baking tray. 3. Melt chocolate and butter in a bowl over a pan of water. Once melted put aside to cool, but do not allow to cool too much otherwise it will start to thicken and set. 4. Whisk eggs, sugar and vanilla essence in a bowl until pale and fluffy. This will take around 5 minutes at top speed. 5. Fold cooled chocolate and butter mixture into the whipped egg mixture. 6. Fold in flour. Make sure the flour is completely mixed in. 8. Pour into baking tray. 9. Bake in preheated oven for around 30 minutes. 10. Remove from oven and leave to cool completely before removing from tin and cutting. Great as a tasty treat with tea or coffee or served warm as dessert.